Clinical studies show that it is effective across a whole range of inflammatory diseases, particularly in treating trauma-induced oedema. Serrapeptase has anti-inflammatory properties similar to those of salicylates, ibuprofen and non-steroidal anti-inflammatories (NSAIDs). It has been successfully used to treat inflammatory diseases of the ear, nose and throat. Due to its anti-inflammatory properties, Serrapeptase has been shown in clinical studies to benefit chronic sinusitis sufferers. In this condition, the mucus in patients’ nasal cavities is thickened and hypersecreted. This thickening causes mucus to be expelled less frequently. Japanese researchers evaluated the effects of Serrapeptase (30 mg/day orally for four weeks) on the elasticity and viscosity of the nasal mucus in adult patients with chronic sinusitis. Serrapeptase reduced the viscosity of the mucus, improving the elimination of bronchopulmonary secretions. 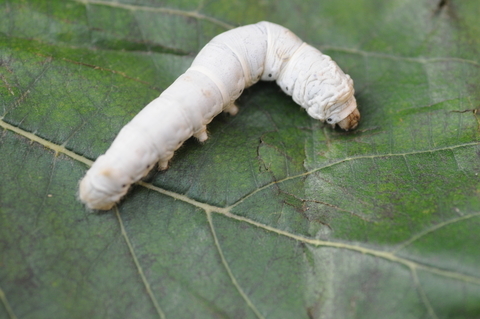 Serrapeptase digests dead tissue – this is how it releases the silkworm from its cocoon. Serrapeptase can digest blood clots, the fibrous layers which make up atheromatous plaque and cysts. The German doctor Hans Nieper has used it to treat arterial blockages and in particular, advises the use of this enzyme to treat blocked carotid arteries when conventional surgery is too risky. Doppler tests conducted after one year’s treatment showed an excellent improvement in blood circulation in the carotid arteries. 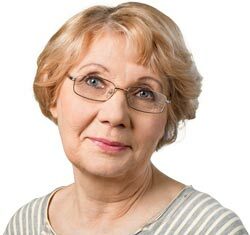 Says Mrs Rooney: “My MS follows a pattern of relapses and remissions. During the relapses I suffered double vision, stiffness, numbness loss of balance, loss of bladder control, impaired use of my arms and legs, fatigue poor concentration, loss of memory and depression. During one of the relapses, in June 2003, when I had a relapse I started to take Serrapeptase. My faith is the backbone of my recovery and I thank God for the Little Silkworm. NSAIDs are among the most widely prescribed drugs for rheumatoid arthritis and other inflammatory joint conditions. Their effects are mediated through inhibition of the biosynthesis of prostaglandins. They work by irreversibly blocking cyclooxygenase, the enzyme which catalyses the reactions of arachidonic acid to endoperoxide compounds. The neurological and gastrointestinal side effects of these agents have been reviewed in considerable detail. All of the NSAIDs, with the exception of Cytotec, inhibit prostaglandin El, a local hormone responsible for gastric mucosai cytoprotection. A common side effect from these medications is gastric ulcers. More serious adverse reactions such as blood dyscrasias, kidney damage and cardiovascular effects have been noted. Most physicians rotate among the ten most widely prescribed NSAIDs, as soon as one causes side effects or stops working. A common side effect from these medications is gastric ulcers. 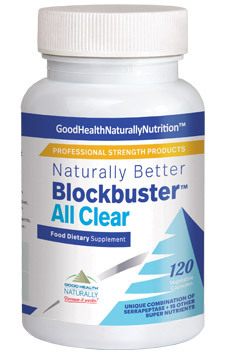 More serious adverse reactions such as blood dyscrasias, kidney damage and cardiovascular effects have been noted. Most physicians rotate among the ten most widely prescribed NSAIDs, as soon as one causes side effects or stops working. The search for a physiologic agent that offers anti-inflammatory properties without causing side effects may have ended with the discovery of the Serratia peptidase enzyme. 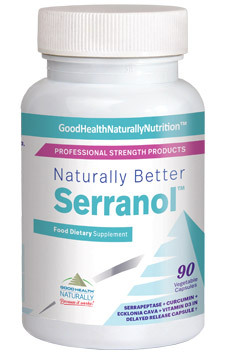 The natural Chelation-Anti-Inflammatory Serrapeptase has had wide clinical use – spanning over twenty-five years throughout Europe and Asia – as a viable alternative to salicylates, ibuprofen and the more potent NSAIDs. Unlike these drugs, Serrapeptase – what Robert Redfern has named ‘The Miracle Enzyme’ – is a naturally occurring, physiological agent with no inhibitory effects on prostaglandins and is devoid of gastrointestinal side effects. See Studies and Technical Information. 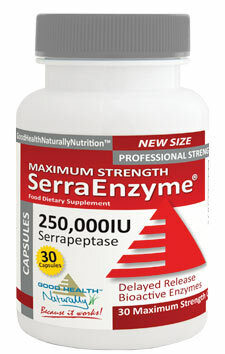 Serrapeptase is a proteolytic enzyme isolated from the micro-organism Serratia E15. This enzyme is naturally processed commercially today through fermentation and was discovered in the silkworm intestine. This immunologically active enzyme is completely bound to the alpha 2 macroglobulin, in biological fluids. Histological studies reveal powerful anti-inflammatory effects of this naturally occurring enzyme. 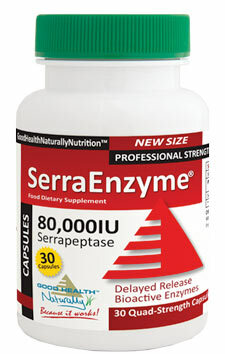 “The Miracle Enzyme” digests non-living tissue, blood clots, cysts, and arterial plaque and inflammation in all forms. The late German physician, Dr. Hans Nieper, used Serrapeptase to treat arterial blockage in his coronary patients. He also reports that Serrapeptase dissolves blood clots and causes varicose veins to shrink or diminish. Dr. Nieper told of a woman scheduled for hand amputation and a man scheduled for bypass surgery who both recovered quickly without surgery after treatment with Serrapeptase. The silkworm has a symbiotic relationship with the Serratia microorganisms in its intestines. It is important to note that cholesterol in its pure state is an antioxidant and a necessary component of the major organ systems in the body. The use of medications, which block cholesterol biosynthesis, may eventually damage the liver and compromise anti-oxidant status of the eyes, lungs and other soft tissues. While studies with SP in the treatment of coronary artery disease are relatively new, a wealth of information exists regarding its anti-inflammatory properties. SP has been used as an anti-inflammatory agent in the treatment of chronic sinusitis, to improve the elimination of bronchopulmonary secretions, traumatic injury (e.g. sprains and torn ligaments), and post-operative inflammation and to facilitate the therapeutic effect of antibiotics in the treatment of infections. In the urological field, SP has been used successfully for cystitis and epididymitis. SP has been admitted as a standard treatment Germany and other European countries for the treatment of inflammatory and traumatic swellings. In one double-blind study of SP conducted by Esch et al at the German State Hospital in UIm, 66 patients with fresh rupture of the lateral ligament treated surgically were divided in three randomised groups. In the group receiving the test substance, the swelling had decreased by 50% on the third post-operative day, while in the other two control groups (elevation of the leg, bed rest, with or without the application of ice), no reduction in swelling had occurred at that time. The difference was of major statistical significance. Decreasing pain correlated for the most part with the reduction in swelling. The patients receiving SP became pain-free more rapidly than the control groups. By the 10th day, all patients were free of pain in the SP-treated group. The therapeutic daily dose was 1-2 tablets (5 mg) 3 times daily. In another double-blind study, the anti-inflammatory enzyme, SP, was evaluated in a group of 70 patients with evidence of cystic breast disease. These patients were randomly divided into a treatment group and a placebo group. SP was noted to be superior to placebo for improvement of breast pain, breast swelling and indurations with 85.7% of the patients receiving SP reporting moderate to marked improvement. No adverse reactions were reported with the use of SP. The use of enzymes with fibrinolytic, proteolytic and anti-edemic activities for the treatment of inflammatory conditions of the ear, nose and throat has gained increasing support in recent years. Treatment with SP lasted 7-8 days, two 5 mg tabs, t.i.d. After 3-4 days treatment, significant symptom regression was observed in the SP-treated group, while this was not noted in the control group. Patients suffering from laryngitis, catarrhal rhinopharyngitis and sinusitis noted markedly rapid improvement. The physicians’ assessments of efficacy of treatment were excellent or good for 97.3% of patients treated with SP compared with only 21.9% of those treated with placebo. In a similar study of chronic bronchitis, conducted by a team of otolaryngolosits, the SP-treated group showed excellent results compared with the placebo group in the improvement of loosening sputum, frequency of cough and expectoration. Other improvements included the posterior nasal hydro rhea and rhinos enosis. The administration of SP reduces the viscosity of the nasal mucus to a level at which maximal transport can be achieved. It has also been demonstrated that the simultaneous use of the peptidase and an antibiotic results in increased concentrations of the antibiotic at the site of the infection. The mechanisms of action of SP, at the sites of various inflammatory processes consist fundamentally of a reduction of the exudative phenomena and an inhibition of the release of the inflammatory mediators. This peptidase induces fragmentation of fibrinose aggregates and reduces the viscosity of exudates, thus facilitating drainage of these products of the inflammatory response and thereby promoting the tissue repair process. Studies suggest that SP has a modulatory effect on specific acute phase proteins that are involved in the inflammatory process. This is substantiated by a report of significant reductions in C3 and C4 complement, increases in opsonizing protein and reductions in concentrations of haptoglobulin, which is a scavenger protein that inhibits lysosomal protease. Carpal tunnel syndrome is a form of musculol-igamentous strain caused by repetitive motion injury. Individuals who work at keyboard terminals are particularly susceptible to this condition. While surgery has been considered the first line treatment for carpal tunnel syndrome, recent studies reveal that the use of anti-inflammatory enzymes (e.g. SP and bromelain) in conjunction with vitamins B2 and B6 are also effective. The use of non-invasive, nutritional approaches to the treatment of this common condition will become more important as a generation of keyboard operators approach retirement. Several research groups have reported the intestinal absorption of SP. SP is well absorbed orally when formulated with an enteric coating. It is known that proteases and peptidases are only absorbed in the intestinal area. These enzymes are mobilized directly to the blood and are not easily detectible in urine. 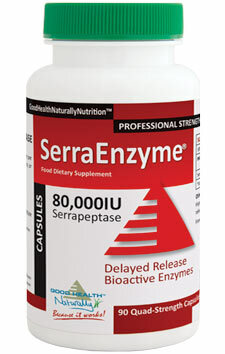 Other enzymes with structural similarities have been reported to be absorbed through the intestinal tract. Chymotrypsin is transported into the blood from the intestinal lumen. Horseradish peroxidase can cross the mucosal barrier of the intestine in a biologically and immunologically active form. Several studies have appeared so far which refer to the systemic effects of orally given proteases and peptidases (e.g. SP), such as repression of oedema and repression of blood vessel permeability induced by histamine or bradykinin. These enzymes also affect the kallikrein-kinin system and the complement system, thus modifying the inflammatory response. In vitro and in vivo studies reveal that SP has a specific, anti-inflammatory effect, superior to that of other proteolytic enzymes. A review of the scientific literature, including a series of controlled, clinical trials with large patient groups, suggests that Serrapeptase is useful for a broad range of inflammatory conditions. If one considers the fact that anti-inflammatory agents are among the most widely prescribed drugs, the use of a safe, proteolytic enzyme such as SP would be a welcome addition to the physician’s armamentarium of physiologic agents. it wasn’t long before he got bored and started looking around for a job. He was pleased when he found one in a local fish factory. But not long after that his problems began. “I got terribly ill and one of my lungs collapsed,” he says, “Fibrosis of the lung was diagnosed. I had to go to the doctor although I don’t like taking orthodox drugs. It had got to the point where I had to sit in a chair and couldn’t walk down to the harbour. “My GP referred me on because he thought I should be receiving oxygen. It didn’t help. I was just getting weaker and weaker I’d tried everything herbal but nothing was doing me any good. “Then my wife heard about serrapeptase from someone in our local health shop. She contacted the company for more information and I started on my first course, last August. It sounds ridiculous but within three weeks I was walking again “I’d been so sad about not being able to walk. We live in a lovely part of Scotland. Now I walk down to the harbour and if I get breathless my wife picks me up in a cab. I have gone back to gardening and having always done a lot of church work and I am back to that again. 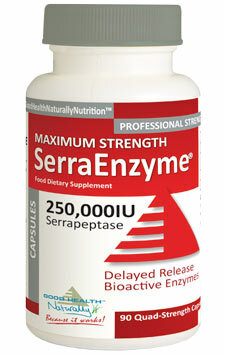 The simple answer is Serrapeptase is the best anti-inflammatory enzyme available. It does NOT affect any drugs whatsoever except that it may make them unnecessary. The inflammatory response is an automatic mechanism employed by the body’s immune system to protect against everyday wear and tear. It is activated by any irritation or penetration of the skin or mucous membranes with the ultimate goal of increasing the flow of blood to the site to increase cleansing. One of the things that happens during this normal process is the formation of a substance called fibrin. Fibrin is a protein that forms a mesh-like structure over the affected area for new cells to form on. But the body may not always have the necessary tools to remove fibrin in the circulatory system when its work is done. Serrapeptase helps ensure the timely removal of excess fibrin. Serrapeptase has also been found to break down mucus in the nasal passages, throat and lungs. In this way it contributes to clear breathing and respiratory comfort. Serrapeptase was originally from silk worms and now is isolated from the nonpathogenic Enterobacteria serratia E15. Each enterically coated capsule contains 500mg of serrapeptase in a base of rice flour. 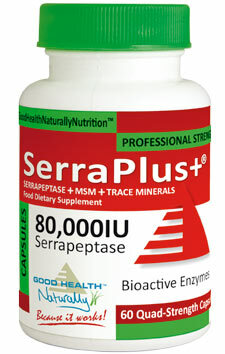 Other brands dilute their product, but GoodHealthUSA offers a potent 80,000 units of serrapeptase activity per capsule. Over the course of several months my St. Bernard dog developed a huge softish lump on one of his front elbows – about a year ago. Getting rather concerned yet reluctant to have a vet do tests and drugs, as a trial l put him on Serrapeptase… just one a day, and after a couple of months the lump had completely disappeared and has never returned. I’ve been taking Serrapeptase myself for over a year, but without suffering any major conditions l can’t ‘see’ what the benefits are. 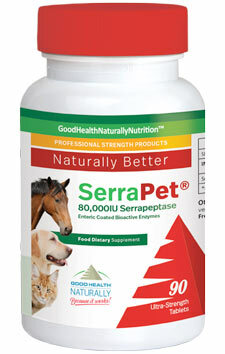 But having witnessed how this worked on my dog l have no doubts whatsoever that Serrapeptase works! I just wanted to tell you about some of the effects of the Serrapeptase so far. I’ve been taking it for only a week. I think, after 1 day, one of the smallest scars I have reduced by about 50%. That was literally overnight. The others are, I think, being effected and I can see the results, but they are much more raised and thicker. I wish I knew how long it will take for them to flatten, I have faith that they will. I’m using the Rose oil and the Penzin on them as well. Additionally, I have chronic pain in my neck and shoulders that has dramatically reduced in this past week. My whole body feels different, actually. The joints are more loose, there is clearly less inflammation. I can sleep with my neck turned to the side and not wake up with it essentially stuck in that position! I can stretch without feeling crunchy, there seems to be more lubrication in the joints and muscles. Really quite impressive. I’m spreading the news about this product to everyone. 1. Always take it on an empty stomach about 30 minutes before or at least two hours after a meal. 2. Preferred times for taking it are upon waking, just before lunch and as you go to bed. 3. Always take it with an 8oz (1/2 pint) glass of water. 4. 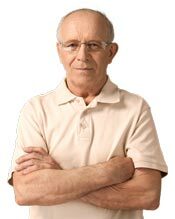 You may continue to take other supplements or prescribed medicine. 5. It is safe for children over the age of one, either by tablet or by breaking open a capsule and mixing with water or honey. The recommended dose is one tablet/capsule x2 times daily. 6. You can continue to take serrapeptase continuously, without diminished results or experiencing any side effects and it is ideal for long term use.